The Clock Tower Gate is a room inside of the Old Clockworks in Luigi's Mansion: Dark Moon. The Clock Tower Gate can be accessed by taking the door on the right inside of the Workshop. The Clock Tower Gate is a two-floor room with a giant clock in the middle. The first floor is covered in sand. The windows are broken and wooden planks are found scattered on the bottom. On the second floor, there are a pair of fans that give money when vacuumed. On the ceiling, there are several large gears that are part of the Movements. A long bridge connects the Drafting Office and the Cargo Room. On the first floor, the door to the left takes Luigi back to the Workshop while the door on the right takes him to the Cargo Room. On the second floor, the door on the right takes Luigi to the second floor of the Cargo Room, but the door on the left takes him to the Drafting Office. The giant clock face blocks the entrance to the the Movements. During A Timely Entrance, Luigi needs to go to the Clock Tower Gate in order to reach the Overset Possessor that has the fourth Dark Moon piece. However, when Luigi gets to the room, he notices that the clock hands and the rotor to move these hands are missing. Professor E. Gadd calls Luigi and tells him that they were stolen by a powerful paranormal source. While E. Gadd checks for the ghost with the Parascope, Luigi needs to fight three Greenies that create sand tornadoes. After getting a call from E. Gadd, Luigi needs to make his way to the second floor of the Clock Tower Gate and into the Drafting Office. In Play Catch, even though the Polterpup doesn't hide in the Clock Tower Gate, Luigi can go through the second floor to reach the Drafting Office where the Polterpup is. However, during this mission the right lantern next to the giant clock face is missing. Revealing it with the Dark-Light Device and capturing the Spirit Balls reveals this mission's Boo. 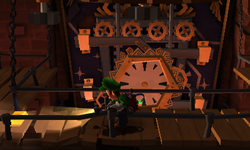 In Showtime, Luigi is automatically pixelated to the Clock Tower Gate where he must place the clock hands and rotor on the clock. There is a hole nearby that Luigi can investigate to see the numbers 7, 3, and 0 inside the Movements. Setting the clock to 7:30 opens the way to the Movements. During Outlandish Interruption, the Clock Tower Gate might be one of the rooms infested with ghosts.